This Saturday, the Mayor's Office of Arts & Culture will hold seventeen concurrent community conversations as part of the Boston Creates cultural planning process. Sixteen of the Community Conversations will take place in different neighborhoods across the city and one additional conversation will be dedicated to youth participants. 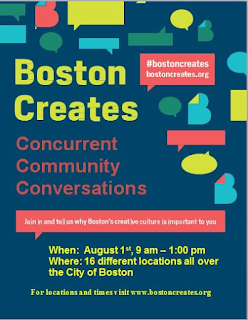 The Boston Creates Concurrent Community Conversations are continuing the community engagement phase of the cultural planning process. Visit Boston Creates for the full list of community conversations and locations. Unable to attend the conversations? Share your thoughts through the Boston Creates Survey.